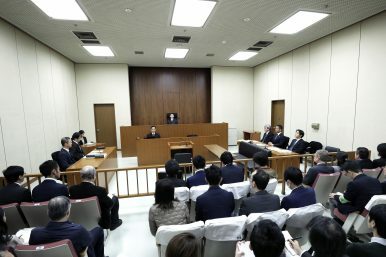 Judge Yuichi Tada, top center, and spectators sit in a courtroom ahead of a court hearing on a case of former Nissan chairman Carlos Ghosn at the Tokyo District Court in Tokyo Tuesday, Jan. 8, 2019. The high-profile arrest of Carlos Ghosn has shone a light on Japan’s long overlooked “hostage” justice system, in which criminal suspects are held for long periods in harsh conditions to coerce a confession. Ghosn, fired as CEO/Chairman of Nissan and Mitsubishi Motors after his November 19 arrest on allegations of financial misconduct (but still CEO of Renault), was originally detained for 21 days – and then, to keep him in custody beyond the legal maximum, has been rearrested on other charges. Ghosn has been refused bail, has not been allowed to have lawyers present under questioning, and has been unable to meet with his family since his arrest. Many Japanese welcomed the new year with soba noodles, mandarin oranges, a heated kotatsu table, and green tea. But Ghosn, like other criminal suspects in Japan, spent the time in a small, cold, tatami-floored cell with only occasional opportunities for bathing and limited exercise. Ghosn has not, and should not, receive preferential treatment. But if Japan wants to live up to its reputation as one of the world’s most advanced democracies, it needs to modernize its criminal justice system. Regardless of the serious allegations against him, or the controversies surrounding his tenure at Nissan, no one should have their rights violated in this way while facing criminal charges. While suspects in rights-respecting democracies have the right to bail for most non-violent crimes, detainees in Japan are not even allowed to request bail while in pre-indictment detention. They can also be questioned over and over without a lawyer. Prolonging pretrial detention by strategically adding new charges is a common tactic in Japan. The criminal procedure code allows authorities to detain suspects for up to 23 days prior to prosecution without the possibility of release on bail. This can be repeated over and over by filing more charges. The charges don’t have to be new, either. Japanese police and prosecutors routinely split crimes to give them the option of filing additional charges. In an absurd practice, when a corpse is found a suspect is routinely first detained on the charge of “corpse abandonment” and then, a maximum of 23 days later, re-arrested for murder. Ghosn has been re-arrested twice and could be re-arrested a third time when his current detention period ends on January 11. When new charges are not filed and a detainee is finally able to request bail, those who have not confessed often have a harder time persuading a judge to approve their bail request. After being held “hostage” in jail for weeks or months, admitting to a crime one didn’t commit may appear to be the best way out. As a result, Japan’s criminal justice system has been littered with coerced confessions. Japanese judges rarely oppose investigators’ requests for arrest. Fewer than 2 percent are turned down. Hiroji Yamashiro, a prominent peace protester, was detained in 2016 for five months before he was finally released on bail after protesting in front of a U.S. military base in Okinawa. Sun-Dyu, a musician, was detained for 10 months without bail on suspicion of stealing 10,000 yen (around $90) from a store, while Atsuko Muraki, a senior bureaucrat, was detained for four months on suspicion of violating postal service laws. Both were eventually found not guilty. Shockingly, the Japanese Criminal Procedure Code does not allow lawyers to be present during the questioning of suspects. This is an approach to the rights of accused people that one would expect in a dictatorship, not in Japan. International human rights law to which Japan is bound guarantees a suspect the right “[t]o communicate with counsel of his own choosing,” which has been interpreted to mean prompt access to counsel without restrictions. The United Nations Body of Principles for the Protection of All Persons under Any Form of Detention or Imprisonment states that, “The right of a detained or imprisoned person to be visited by and to consult and communicate, without delay or censorship and in full confidentiality, with his legal counsel may not be suspended or restricted save in exceptional circumstances … when it is considered indispensable by a judicial or other authority in order to maintain security and good order.” While Ghosn is a high-profile case, allowing him access to a lawyer while being questioned certainly does not threaten Japan’s security or public order. Japanese lawyers and civil liberties groups, such as the Japan Federation of Bar Associations, have long called for the law to be modernized to end abuses. Yet Japanese officials are oddly defensive of this archaic system. In 2013 Japan’s human rights envoy, Hideaki Ueda, told a UN panel to “shut up” after a diplomat pointed out that Japan’s criminal justice system depends on coerced confessions and described it as being from the Middle Ages. Anyone arrested in Japan deserves the basic rights to the presumption of innocence, a prompt and fair bail hearing, and access to counsel, including during questioning. The evidence will eventually show whether Carlos Ghosn is guilty of the charges against him, but his case has already shown that it is time to end Japan’s hostage justice system.